Whenever I am with friends or relatives, the conversation always heads towards food. Maybe we’re just hungry, but what is more social than eating? My Long Island cousin’s loved my video for Christmas in NYC 2011. They didn’t have time to see the Christmas decorations in person, but they still felt the “NYC Experience”. In discussing the video, I brought up my new tradition. Since the video is shot at night all over New York City in the middle of December, it tends to be cold. Hot food is always a great way to end the shoot. A couple of years ago, I used Zagat to find an nearby Indian Restaurant but got lost on the way thanks to the lousy GPS in my Palm Pre. Hungry and tired, I stopped in front of Joe’s Shanghai and looked at the mob headed inside at 11PM. This must be a good place! I read the review in Zagat’s and saw SOUP DUMPLINGS! Now, that’s different. I went inside and loved it! It’s been a tradition every year since … or so I thought. This year, I confused John’s Shanghai for Joe’s Shanghai and was not as impressed. My cousins wanted to try “soup dumplings” so I looked it up in FourSquare. The first review of John’s was lousy! Now, I knew something was different when I was there; however, I also knew that they had two restaurants and just assumed that I went to the other one. I started exploring in FourSquare and finally realized that I went to the wrong place. Obviously, the owners of John’s Shanghai are hoping for people to make the same mistake. Joe’s Shanghai has been a NYC favorite since 1995 and is credited with bringing “soup dumplings” to New York. By the way, “soup dumplings” are a traditional Chinese pork dumpling which are filled with soup broth (on the inside). They wiggle like Jello and are hilarious to serve to a newbie. Joe’s Shanghai even has a Kill Bill-inspired YouTube video about the experience. Social Media is the great equalizer. Sure, there is Zagat and even the reviews in New York Times, but FourSquare and Yelp! allow for the average person to add their two cents. Professional food critics have a different palate based on their extensive experience. Your average customer wants something that tastes great at a fair price. It’s a different standard. FourSquare provides a great way to “get the word out” about your favorite places. Both FourSquare and Yelp! have explore features where you can find new places in the vicinity based on your smartphone’s GPS. It’s the perfect way to discover new places and read about the experiences of others while you are in the moment. 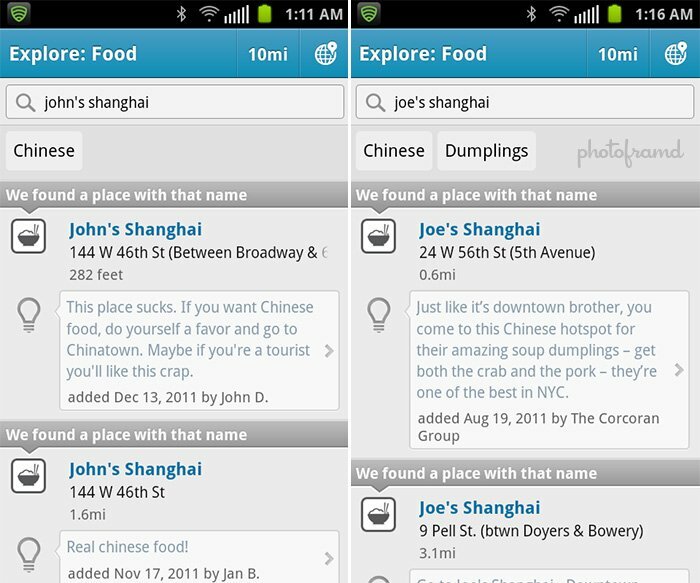 The next time you are using FourSquare, take a minute to write a tip or a mini-review. It’s a great way to show your support for a place that you really “like”. Think about it this way … if you can encourage another person to try a small business that you personally enjoy, you are helping that business grow its clientele. The more people that use a small business, the more likely it will be around in the future. In this economy, that means something.